Taylor’s wilderness journey began as a three year old when Lin & Al dragged him deep into the Yukon wilderness! He hiked the Chilkoot Trail at age 7 and promptly won a public speaking contest titled Klondike Gold Rush! At age fourteen, Taylor worked for Canoe North Adventures as a porter. 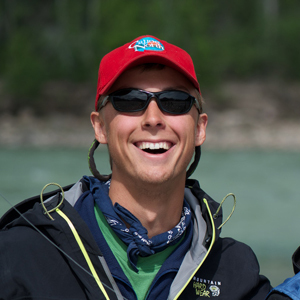 He has graduated with from the Adventure Studies Program at Thompson Rivers University with a Diploma in River Guiding in canoes, rafts and kayaks having achieved specialized training in Wilderness First Aid, Search & Rescue, Swift-Water Rescue and Hiking. Taylor is a keen fly-fisherman, avid hiker and dedicated whitewater specialist and these passions have inspired him to explore wilderness regions of New Zealand, central Europe and more recently Costa Rica. As a twenty-something, Taylor has an impressive resume of northern river journeys spanning thousands of river-miles – way more than his Dad had experienced at that age!